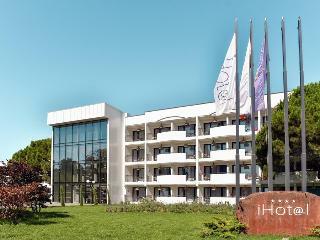 iHot@l Sunny Beach is a family club hotel located only 100 meters from the sandy beach in the greenest area of Sunny Beach resort. The walk alley, attractions and shopping centres are closely located. 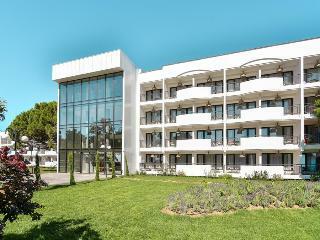 The truly modern and stylish family iHot@l Sunny Beach has innovative spirit and excellent location close to the beach. 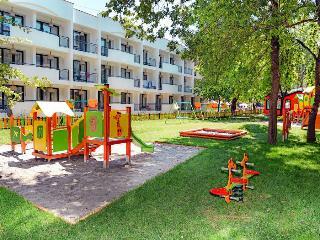 Here everything is designed to suit a leisure family who wish a recharging summer holiday. 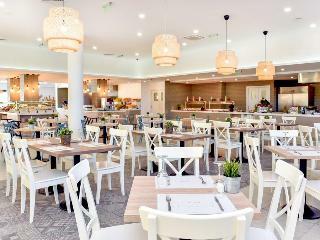 Inviting public living areas, well-designed family rooms and hospitality online technologies welcome the guests of the intelligent iHot@l. Surrounded by green gardens and relaxing atmosphere this hotel is oasis in Sunny Beach and the right spot for ones looking for a very family vacation . Entertaining animation team and service minded hotel staff will take care of your fantastic summer holiday. New smart technologies and online platform help you to enjoy and take advantage of the innovative solutions in the hotel. iGuests are happy to experience smart TVs, digital key to unlock their room and online application that allows guests to look and book hotel services and activities. Check the next fitness class, order room service or see today`s gourmet menu online. 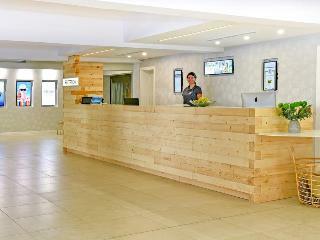 Touchscreens and sensor technologies welcomes the guests and give information at reception and lobby area. High speed Wi-Fi connection is all around the hotel and in the rooms. Wellness treatments in the design SPA center with indoor heated pool, meditation practices in PaKua center and sport in GYM. Kids club entertain the children and will not leave them bored. An outdoor swimming pool with different depths and surrounded by green nature is the favorite place to enjoy the sun and the water. 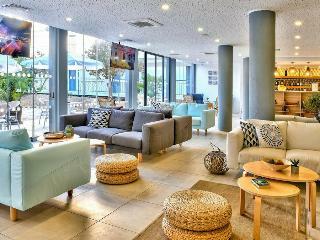 ACCOMMODATION - The hotel has 209 newly furnished rooms including elegant double rooms and comfortable family rooms. 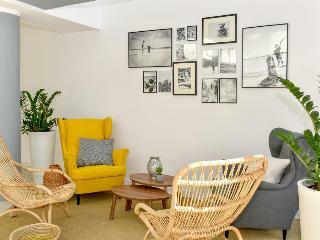 Double rooms - Double rooms are modern furnished with one king-size bed or two twin beds and choice of two types of pillows, one additional bed, a desk with a comfortable chair and a wardrobe. Maximum accommodation is two adults and one child or three adults. All rooms are equipped with flat smart TV, free high-speed wi-fi, usb charging ports, safety box, telephone, air-conditioning, bathroom with shower and a balcony. All rooms have tiles floor. A complimentary minibar with drinks and a snack on arrival. All rooms are non-smoking. Size 29sq.m. Family rooms with BunkBeds – 1 room - Family rooms consist of one room with a king-size bed and two bunk beds. Rooms are equipped with tiles floor, desk with a comfortable chair and a wardrobe, flat smart TV, free high-speed wi-fi, usb charging ports, safety box, telephone, air-conditioning, bathroom with shower and a balcony. Maximum accommodation 2 adults and 2 children. A complimentary minibar with drinks and snacks on arrival. All rooms are non-smoking. Size 33sq.m. Family rooms – 2 rooms - Family rooms consist of two rooms - one main bedroom with a king-size bed and a second bedroom with two single beds. Equipped with desk with a comfortable chair and a wardrobe, flat smart TV, free high-speed wi-fi, usb charging ports, safety box, telephone, air-conditioning, bathroom with shower and a balcony. Maximum accommodation 2 adults and 2 children or 4 adults. A complimentary minibar with drinks and snacks on arrival. All rooms are non-smoking. Size 52sq.m. ZEN center – Meditation & Event hall – a place for Meditation, Relax, Yoga, Tai Chi, Qi Gong, Pilates, Salsa, Bachata. GreeN Hall – Event room. GreeN Terrace - Bar & A-la-carte restaurant – Cosy spot for drinks and delicious fish & Italian food set in a relaxed open dining atmosphere. 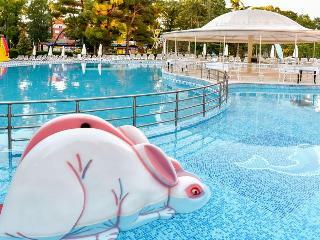 Mini Aqua park – 2 brand new water slides for an exciting day around the pool with the whole family. Daily entertainment program - Spectacular evening shows performed by top artists. More sport entertainment, dancing and singing. SPA - Relaxing ambience and Professional therapists team will take care of your body and soul. Thai traditional and Classic massages, Foot reflexology, Aroma and Facial treatments. Main Buffet Restaurant “Saffron” - International cuisine inspired by the concepts of healthy and diverse food with a lot of fresh vegetables and fruits, meat and fish dishes. Show-cooking, show-carving and theme buffets - BBQ, Mediterranean, Asian, American, Italian, Bulgarian, Tex-Mex evenings. Аla-carte restaurant - The ala-carte restaurant offers a relaxing atmosphere and a choice among French, Fish or Italian gourmet set menus for dinner. Water included. Bottled drinks upon charge. Reservation required. Reservation fee 10 euro per person for breakfast/dinner. 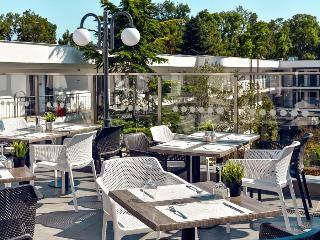 Pizza & Snacks Corner - Enjoy variety of hot and cold snacks by the pool. Pizza, French fries, burgers, salads, fruits and sweets. 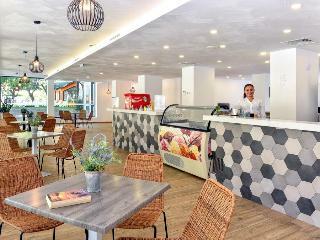 Ice cream & Pool bar - Local alcoholic and non-alcoholic drinks, variety of cocktails, soft drinks, beer, wine, tea, coffee and water. Variety of ice-cream all day long. Lobby bar - The lobby bar and the cosy library corners around are a pleasant surprise for guests longing for some time only for their favourite book over a cup of fresh coffee or aromatic tea. Lobby bar offers local alcoholic and non-alcoholic drinks, variety of cocktails, soft drinks, beer, wine, tea, coffee and water. ANIMATION - Daily animation programs for children and adults 6 days a week. Sport animation on the pool or in the garden – including Zumba lessons, Yoga, Pilates and a lot of fun. Volleyball on the beach, table tennis, darts, chess and enjoy the day with our professional animation team . Evenings shows with singers, dancing, authentic costumes and decors set a mood for adults and children 6 days/week. On the 7th day we invite you for an open air cinema under the stunning stars. 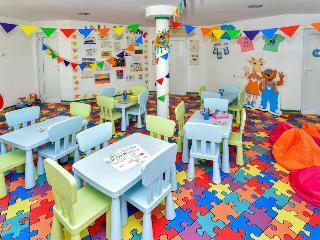 FOR CHILDREN & TEENS - Kids club is located in the garden area of the complex and offers activities in English and German for children 3-6 years and 7-12. There is a fantastic large outdoor children playground for different ages. 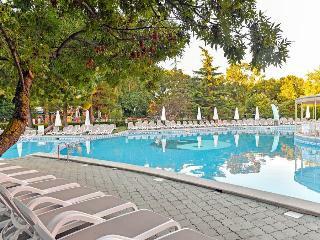 SWIMMING POOLS - There is an outdoor swimming pool with sections for children and adults with different levels of depth. The outdoor pool is surrounded by a peaceful garden and a sunbathing zone with comfortable sunbeds, parasols and completed by the relaxing music background. Free parasol and sunbeds by the pool. 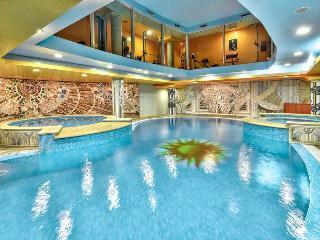 Free access to indoor pool in the SPA centre and sauna. SPA & WELLNESS - Enjoy our design SPA centre for ultimate relaxation of soul and body. Refresh your mind and let our quality staff take care of you with variety of healthy spa treatments. Free access to our design indoor swimming pool and sauna. Classical massages, authentic Asian and other massages, Turkish bath and wellness procedures are upon charge. FREE HIGH-SPEED WI-FI - Free high-speed internet is available in the rooms and all public areas. Free use of tablets upon requests at reception. NON SMOKING HOTEL POLICY - The majority of guests prefer a non-smoking hotel environment. Therefore, we have applied this preference in iHot@l Sunny Beach. We do provide designated smoking areas outside the building to accommodate the needs of guests who smoke. Page rendered in 0.0865 seconds using 2.37 MB (4 MB) of memory.